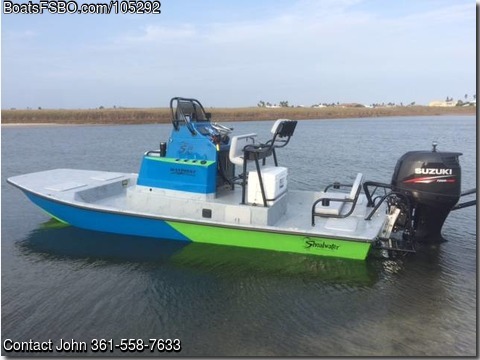 Contact the owner @ 361-558-7633 or jssaunders9@gmail.com...I am selling my "Like New" 2018 Shoalwater 20 Cat that I purchased in November 2017. The boat is in excellent condition with only 100-125 hours on the Suzuki DF150TL engine. I would have to have a dealer verify the exact hour. The boat sits on a brand new 2018 Coastline aluminum trailer. I own the boat outright and have all the original documents This boat can go anywhere you need to go. It can run shallow, has lots of surface room and storage, and is easy to get in and out of. I have also taken it out several miles off the beach in 40+ foot water and it performed well chasing schools of fish. The Suzuki 4 stroke runs quiet and does not consume a lot of fuel. The boat is over 8 foot wide (beam width) with a lot of fishing surface. Add on's made to the boat: Two tone hull (blue, lime green, with titanium decking) 8' Sportsman II Power Pole Garmin 74SV W/ Chip Mapping with dual display 20'' LED light bar for navigating in the dark 2-12V ACC Plugs 2 pair of LED Deck courtesy lights (blue) front and back Lenco Trim Tabs 12" raised console front live well Rear center live well Igloo cooler (never used for fish storage) Aluminum wheels on trailer w/ spare tire Hydraulic Steering 4 stainless steel pull cleats hydraulic jack plate w/ blinker trim Also, Wet Black powder coated options include: Wade Ladder Leaning Post w/ 4 rod holders, permanent backrest and armrest Grab bar w/ cup holders Front handles w/ cup holders Folding rear deck bench seat (removable) for extra passengers Give me a call if serious. It is in great condition and ready to go. I will only accept cash or will need to verify funding as being legit with my bank. No solicitations or trade offers please.